Cold and flu season has always been unpredictable – until now. Just tell us where you live and we’ll show you your cold and flu risk for the next three weeks. We’ll also offer advice to help you and your family prepare for cold and flu season. 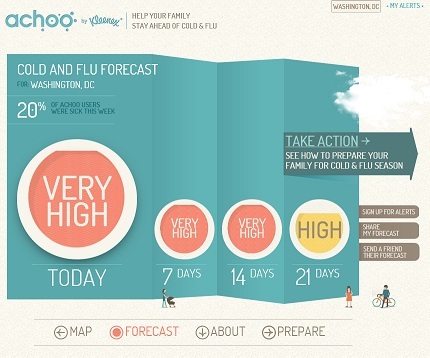 Learn more about achoo by Kleenex* cold and flu predictor – the first and only tool that can predict when cold and flu will reach your area. To read more, go to the site. Tags: Flu season, kleenex, myachoo, Tool of the Day. Bookmark the permalink.